Inventory We are a resale marketplace, not a box office or venue. Ticket prices may exceed face value. This site is not owned by UNO Lakefront Arena . The UNO Lakefront Arena is another gem in the Bayou for fans of concerts and other events that live in New Orleans. The city of New Orleans has more to offer that just Jazz clubs and Mardis Gras and for the locals here the UNo Lakefront Arena offers a great chance to see the nations biggest touring acts. It is home to the University of New Orleans Privateers basketball team. 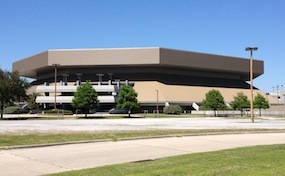 The UNO Lakefront Arena is a 10,000 seat multi purpose arena, in New Orleans, Louisiana and was built in 1983. In the aftermath of hurricane Katrina, the Lakefront Arena was in need of major repairs. The flood damage was extensive and pieces of the roof had been torn off by the wind. The repairs took two years to complete because of the economic status of Louisiana, but have been returned to its former glory. UNOLakefront.ArenaNewOrleans.com is a privately held company that specializes in the sale of tickets in the secondary market. We are not affiliated with any official supplier or box office. To purchase tickets to any UNO Lakefront Arena events simply call our operators at anytime or click on the event you wish to attend.